EARLY INTEGRATION sitcom with SPIKE MILLIGAN as a Pakistani working in a factory (at - obscure kids' TV coincidence ahoy - Lillicrap Ltd.) with ERIC SYKES as the reasonable foreman, KENNY LYNCH as - cue controversy - a black racist, and SAM "Orlando" KYDD as the unreasonable Smellie. Set in the staff canteen and on the factory floor at Lillicrap Ltd, makers of seaside novelties, Curry & Chips was a Johnny Speight comedy about Kevin O'Grady - a bizarrely named Pakistani immigrant (a blacked-up Spike Milligan) being "civilised" by working class Brits, led by the liberal-minded but somewhat confused factory foreman, Arthur (Eric Sykes). Sam Kydd featured as the malodorous Smellie, with Norman Rossington and Geoffrey Hughes as racist white Liverpudlians, and singer/actor Kenny Lynch as a black anti-Pakistani. In addition to the liberal slinging about of racist terms there was a good deal of (mostly harmless) swearing, one viewer noting that the word "bloody" was said 59 times in a single episode. 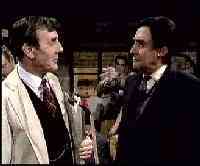 (Only Eric Sykes didn't swear in the show - he simply refused to do so). Produced and Directed by Keith Beckett, this sitcom was very much a product of the 60s. It tried (not always successfully) to deal with racism, bigotry and class hatred in a light-hearted manner, and this series would not (could not) have been made today. 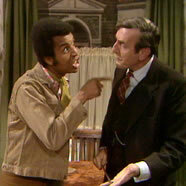 Political correctness ensured that two similar series - The Melting Pot, also starring Milligan as a Pakistani (six episodes of which were made in 1975), and Jewel In The Crown, for which a pilot was shot in 1985 - were scrapped, although one episode of the former was shown in June 1975 (the BBC refused to show the subsequent five episodes as the ingredients constituted way too much of a heady brew for the Beeb to handle). Ironically Curry & Chips was LWT's first sitcom made in colour . . .